Over the centuries, a number of royal buildings have stood on this spot. In the middle ages it was the site of a stone house where many prominent people dwelt including Dukes Erik and Valdemar in year 1310. Later Gustav Vasa and his sons, Erik XIV and Johan III, had a sumptuous Renaissance palace with round inner courtyard built. Completed it in 1580 it burned down in 1687. What remained was transported to Stockholm to be used in the construction of ‘Slottet Tre Kronor (The Castle Three Crowns). Remains of the castle grounds are still visible on the grounds of the current castle. 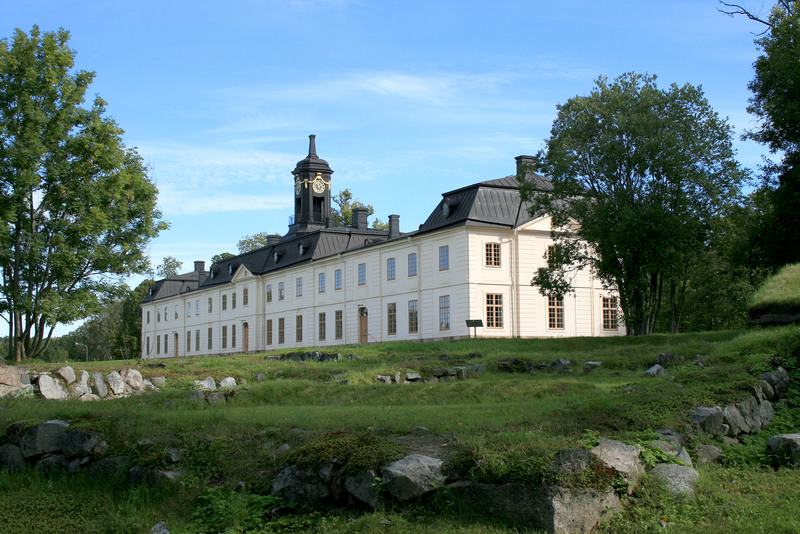 The current castle was built on orders of Fredrik I between 1734 and 1739 as a hunting lodge for Queen Ulrika Eleonora. Desgined by Carl Hårleman as a Rococo palace built after French examples, it became a model for many Swedish country houses in the latter part of the 1700’s. Other additions and changes were made in the 1770’s by Lovisa Ulrika. After Livisa Ulrika’s death in 1782 the castle stood empty for over 100 years. With the discovery of granite in the area which could easily be broken, the castle was transformed into a forced labor and alcoholics’ prison in 1891. The castle was later (1910 maybe?) used to house hardened criminals. 337 cells with sheet metal walls and grilled doors were installed. In 1966 its use as a prison came to an end. The surrounding prison wall is gone, but the warden’s house and some of the staff housing remain nearby. Again standing empty for a number of years, the castle was at last restored between 1994 – 2003 by the state for 36 million kronor with the architect Tallius Myhrman. The facade has been restored to the bright color that Carl Hårlman chose to mimic French sandstone. The windows have been painted a golden brown oak shade. None of the original wallpaper remained, but the National Property Board had 12 central rooms wallpapered with period examples from Drottningholm Castle. In the course of the restoration work, it was decided not to hide the long history of prison use. To this end a number of jail cells have been reconstructed in one of the rooms.